Combine dry ingredients for the crust in a medium mixing bowl. Combine wet ingredients for the crust in a measuring cup. Place wet ingredients in a blender and pulse several seconds to blend. Mix wet ingredients with dry and form into a ball of dough. Divide in half and set aside while the filling is prepared. To prepare the filling place all ingredients except the kuzu root starch in a medium saucepan and bring to a boil. Reduce the heat to medium low and simmer about 10 minutes until the peaches are tender. Allow to cool several minutes while baking the bottom pie crust. Preheat the oven to 350°. Roll out half the dough on a floured surface, place in a 9" pie plate, poke several small holes in the crust with a fork. Bake for 10 minutes. Remove, lightly moisten the edges of the bottom crust with water and add pie filling. Roll out remaining dough and place the top crust on the pie. 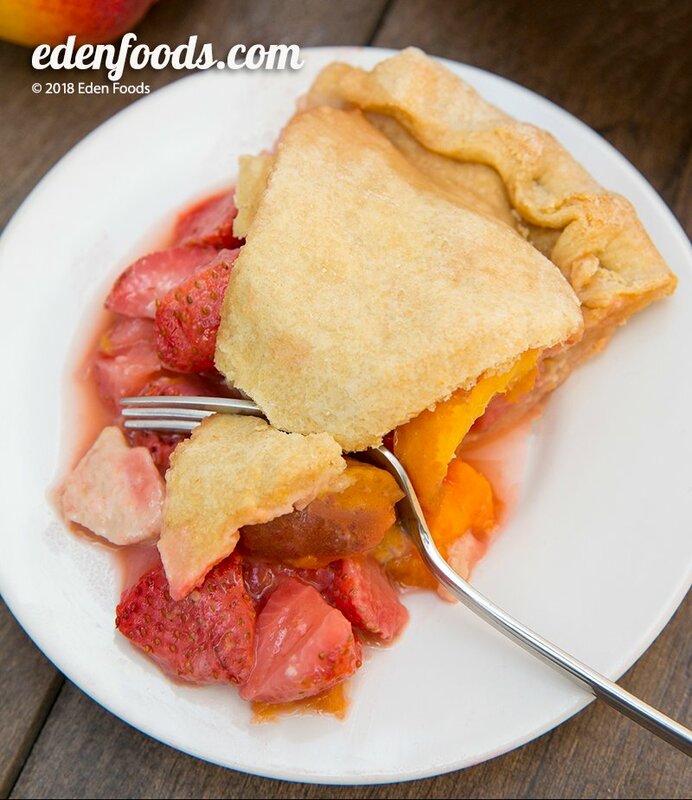 Crimp edges with a fork or pinch with fingers to seal top and bottom crust. Using a fork, poke several shallow holes in the top crust to allow steam to escape during baking. Bake for for another 20 to 25 minutes until the top crust is golden. Remove and cool before slicing.